"Selected Letters of Dawn Powell "traces a richly talented writer's fifty-two-year journey from her childhood in a small Ohio town to the glitter of Manhattan. 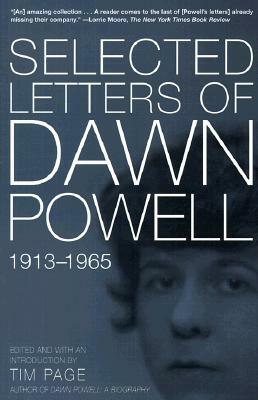 Powell was a prolific letter writer, and her correspondence provides an intimate look at the woman about whom "The New York Times" recently said: " She] is wittier than Dorothy Parker, dissects the rich better than F. Scott Fitzgerald, is more plaintive than Willa Cather in her evocation of the heartland, and has more supple control of satirical voice than Evelyn Waugh." Living most of her life in Greenwich Village, Powell supported herself as a writer through the Great Depression and two world wars while nursing an autistic son, an alcoholic husband, and her own parade of illnesses. In her correspondence, including gossip-filled letters to such luminaries as Edmund Wilson, John Dos Passos, and the legendary editor Max Perkins, we find the record of a courageous and dramatic woman who produced fifteen novels, ten plays, and more than one hundred stories.